Come join us for Steben Alexander’s vernissage! Unveiling his new series "Mademoiselle Rockefeller". Which explores the use of Polaroids and print. "Steben Alexander is a contemporary Canadian visual artist. He works primarily with photography, print medium and video. His artistic practice shows a reality of enigmatic subjects that bring beauty to the dark and mysterious. His models are staged into scenarios that are constructed to narrate stories through figurative photographs, ultimately immortalizing his models as works of art." Exhibition will run until November 18, 2018. Joignez-vous à nous pour le vernissage de Steben Alexander! Cette exposition dévoilera sa toute nouvelle série Mademoiselle Rockefeller. L’exposition se tiendra au galerie BBAM!, située à 808 rue Atwater, du 25 octobre au 18 novembre 2018. Une réception d’ouverture aura lieu jeudi le 25 octobre à 19h. L’exposition se poursuivra jusqu’au 18 novembre 2018. Steben Alexander's artwork titled ''Chlorophyllic Gaze'' was on display at Artsida8 ACCM fundraiser exhibition sponsored by TD Canada Trust at Galerie MX, Montreal, March 2, 2018. On March 12, 2018 ''Chlorophyllic Gaze'' sold at auction at Salon Urbain, Place des Arts and was proudly the highest seller of the evening. Artsida8 raised over $137,000. All funds raised go towards ACCM’s support services for people living with HIV, as well as its sexual health programming for youth and at-risk communities. To learn more about ACCM and Artsida follow the links. Steben Alexander is a featured LensCulture Exposure Award contestant 2018. The LensCulture Exposure Awards 2018 aims to discover and showcase the world’s best contemporary photographers. Awards will culminate with a series of international gallery and festival events, worldwide media coverage, and career-changing exposure for the jury’s six winners, eight jurors’ picks and 25 finalists. Click the links below to favorite/like and share Steben's Digital Anachronism. Steben's Chlorophyllic Gaze is featured on Artbomb! Online Auction. Artbomb is a curated, subscriber-based daily online auction featuring artwork by local art stars. This is an exciting experience to partake in a live auction! We love the candour of @steben.alexander’s Polaroid series. Glamour meets reality. Briefly describe the work you do? I am a visual artist and I work primarily with photography, print medium and video.Currently, my main focus is portraiture and people. I have a fascination for eccentric and unique figures, faces, shapes. My models are staged into scenarios that I construct to narrate stories through figurative photographs; ultimately immortalizing my models as works of art. I'm fascinated by what makes images and things timeless. My artistic practice shows a reality of enigmatic subjects that bring beauty to the dark and mysterious. Nowadays, in the age of the Internet and search engines ; you can learn about anything you want, whenever you want about anyone or any subject. The information is out there. It's amazing to live in these times! However I find beauty in the unknown. Subjects of obscurity. Artwork with no given meaning . I come from an artistic upbringing, raised by my mother. She always encouraged us to express ourselves. Both my sisters are illustrators, so they are what I can recall my earliest influences,encouraging my creative side. I started drawing early, learning to express myself with images at a very young age. My love for aesthetics evolved into photography. Then, at the age of 15, I had the opportunity to meet with David Lachapelle's muse Amanda Lepore, which would lead me to working and taking her portrait, as one of my first pieces. We are still close friends today.Amanda's portrait will always resonate the beginning of my career as a photographer. Professionally it’s difficult for me to say an exact goal. Creating art has become a necessity for me over time. After a huge project I've completed I usually need to take a lot of downtime and take care of myself, because it takes a lot of energy for me to go through the process. I would like to continue exploring new themes and experimenting with new materials and exhibiting my work. All my portraits start with an idea that is first sketched, researched and planned. Lighting diagrams are created, the right team is chosen and then the shoot is executed,which then leads to the editing. The model and photograph are seen as the ‘’sketch’’ with lighting,makeup and further modifications to the image which influences the final product. The sketch and original idea goes through many transformations on the way to becoming a final product. I have always been inspired by personas throughout history that are remembered for their eccentric personalities. Enigmatic subjects inspire me. Many of my model’s are not professional models. Many of which were first acquaintances or that I scouted for a particular idea. That I would dub as my ‘’Muse’’ for various projects. The most recent example of this is the series I created about La Marchesa Casati who was an Italian patron of the arts and a muse for artists such as Man Ray, Boldini and Cartier amongst others. She lived a very extravagant lifestyle, which ended in quite a tragic way; my pieces narrate her story through photo and film. I am currently working on a new photography series inspired by 17th century Dutch paintings.Traditionally still life, I will be including models heads on table tops exploring the Memento Mori and Vanitas themes. I am also working on an ongoing series of woven photographs; which focuses on exploring a variety of materials that impact the result of the outcome of the photograph itself, aesthetically speaking, through gels, lighting, colors and by revisiting more traditional photographic methods. How do you define your art in terms of style? My artistic practice shows a reality of enigmatic subjects that bring beauty to the dark and mysterious. With my interest in the 1920s-1940s era and film noire movement, I explore traditional lighting and portraiture, immortalizing my models as works of art. My models are staged into scenarios that I construct to try to depict stories that I tell through figurative photographs. I have always been inspired by personas throughout history that are remembered for their eccentric personalities and try to retell their stories through my work.My current projects are focusing on exploring a variety of materials that impact the result of the outcome of the photograph itself, aesthetically speaking, through gels, lighting, colors and by revisiting more traditional photographic methods. How does this piece/series relate to the theme of Orange? What inspired it? What is its conceptual background and tone? How do you want people to feel after viewing/reading it? The orange gels used in this series give the image a warm euphoric feeling, they were used to distort perspective and the model herself therefore creating a distance between the viewer and the model. Orange symbolizes happiness and sexuality, the model is seen drowning yet her expression is filled with joy. My artwork is subjective to the viewer. What techniques and materials did you use for this piece/series? Which artists/writers do you admire? Steben Alexander's artwork titled ''Glamorous Monique'' has been featured at the Artsida7 ACCM Fundraiser exhibition sponsored by TD Canada Trust, March 3rd 2017 at Montreal, Galerie D. It was sold at Auction at the Museum of Contemporary Art of Montreal, March 12th 2017. Steben Alexander was Awarded the Audience Choice Award 2017 presented by Claude Cormier + Associés. To know more about Artsida and ACCM please click here. Steben Alexander's artwork titled ''Chlorophyllic Gaze'' has been featured in Saatchi Art's New Pop Art Collection curated by Evangelyn Delacare. For more information regarding this piece, please feel free to visit Saatchiart.com. Venez nous joindre pour le vernissage de Steben ! Célébrons en grand nombre! Cette exposition présentera ma nouvelle série comprenant des portraits triptyques de 72 pouces de largeur de mes muses énigmatiques, mettant en vedette la chanteuse soprano de renommée internationale et aussi candidate des derniers Oscars, madame Sumi Jo. L’exposition aura lieu au Georges Laoun, situé sur 4012 rue Saint-Denis, du 1er mai au 31 mai 2016. Une réception d’ouverture aura lieu ce mardi 10 mai de 17:00 jusqu’à 19:00. L’exposition se poursuivra jusqu’au 31 mai 2016. Come join me for the vernissage and celebrate! This exhibition will showcase my latest series which include portrait triptychs that measure 72” in length of my enigmatic muses featuring internationally renown soprano and recent Oscar nominee Sumi jo. The exhibition will take place at Georges Laoun, located on 4012 Rue Saint-Denis, from May 1st through May 31th, 2016. An opening reception will be held on Tuesday, May 10th at 5:00pm – 7:00pm. “Steben Alexander’s artistic practice shows a reality of enigmatic subjects that bring beauty to the dark and mysterious. With his interest in the 1920s-1940s era and film noire movement, he explores traditional lighting and portraiture, immortalizing his models as works of art. Steben’s models are staged into scenarios that are constructed to depict stories that he tells through figurative photographs. 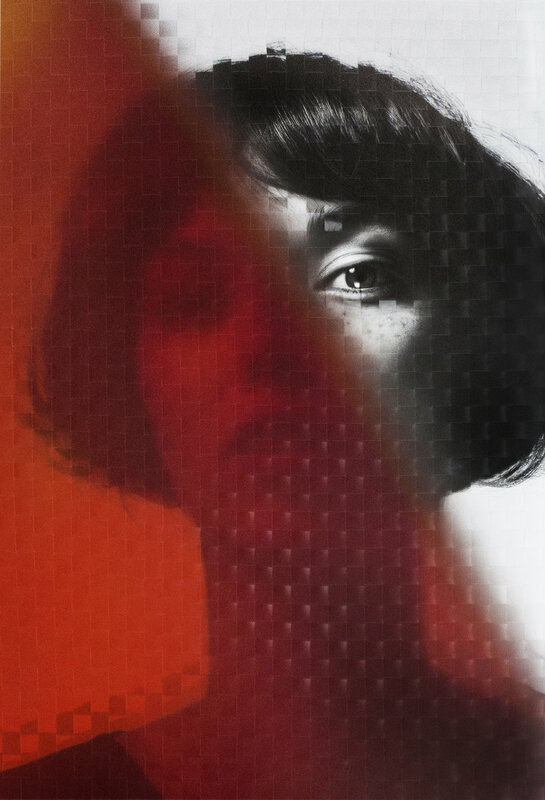 His current projects are focusing on exploring a variety of materials that impact the result of the outcome of the photograph itself, aesthetically speaking, through gels, lighting, colors and by revisiting more traditional methods. The exhibition will run until May 31, 2016. Steben Alexander reveals his newest series, a collection of original Polaroid portraits immortalizing his muses as works of art. 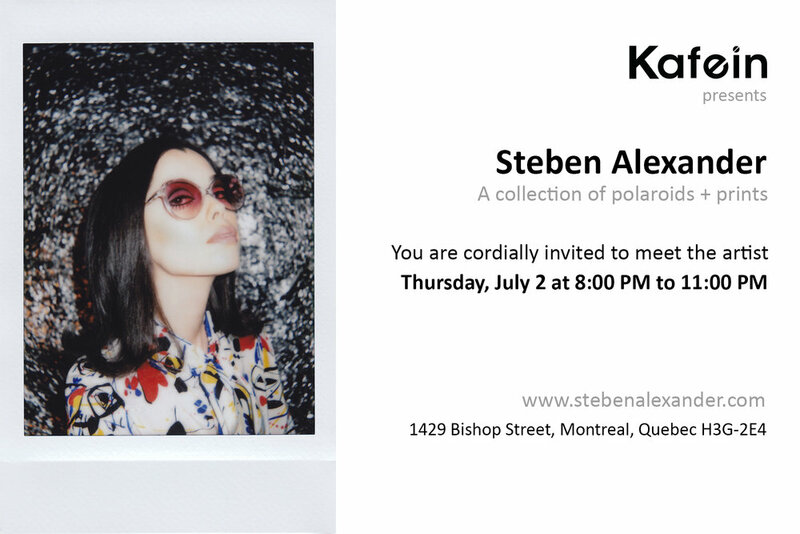 Steben’s series “Auto Portraits” and “Kiki de Montparnasse” will also be on display. MA MUSE M’AMUSE EXHIBITION by artist Steben Alexander at Galerie D.
Steben Alexander’s Ma Muse M’amuse exhibition resurrects the life and legend of Europe’s most eccentric figure the Marchesa Luisa Casati. Known for her extravagant lifestyle, she has appeared in over 300 works of art, inspiring people and new fashion trends wherever she goes and appearing in the artworks of artists such as Man Ray, Boldini and Cartier. Through the use of photographic art and a short film, Steben immortalizes his twentieth century muse by bringing light to her legend in the twenty first century. My artwork will be displayed at the International Toronto Art fair 2014 from the 24th to 27th of October at booth #1206 NEXT. A special thank you to São House gallery for the great opportunity ! São House is pleased to present a retrospective of enigmatic artwork by photographer Steben Alexander. The artists photographic artwork, will be on display at the Club Sportif MAA, located on 2070 Peel Street, Montreal from 8 to 30 of October.